I am a professional graphic artist who specializes in mobile and web user interface design. I am also a composer of neoclassical music and author of three published books in the fantasy genre. I became a Pescetarian in December 2012, just because I needed to change my diet from crappy food to better choices. I felt this was a good way to do it, but I could not give up seafood - that is one thing that I love more than any other kind of food. I ran out of recipes and soon began a quest for more but finding good pescetarian recipes was difficult. 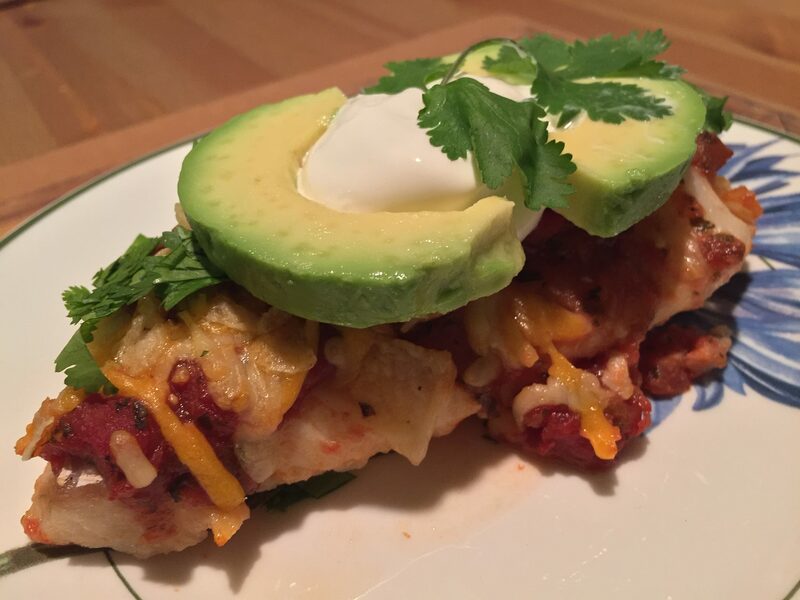 I decided to start making my own and that's when I created this blog - a place where I could share recipes I have found that are awesome and recipes I have created myself through one of my favorite pastimes - recipe experimentation. Okay, I just fixed this for the first time today and holy crap this is the best salmon dish I have ever had!! Not only that it’s super easy to make…well maybe just easy – but super easy for me. 2. Sprinkle salt, pepper and a 1/2 tsp of the herbs over front and back of the fish. 3. Place fish into an 11×7″ baking dish, coated with cooking spray. 4. 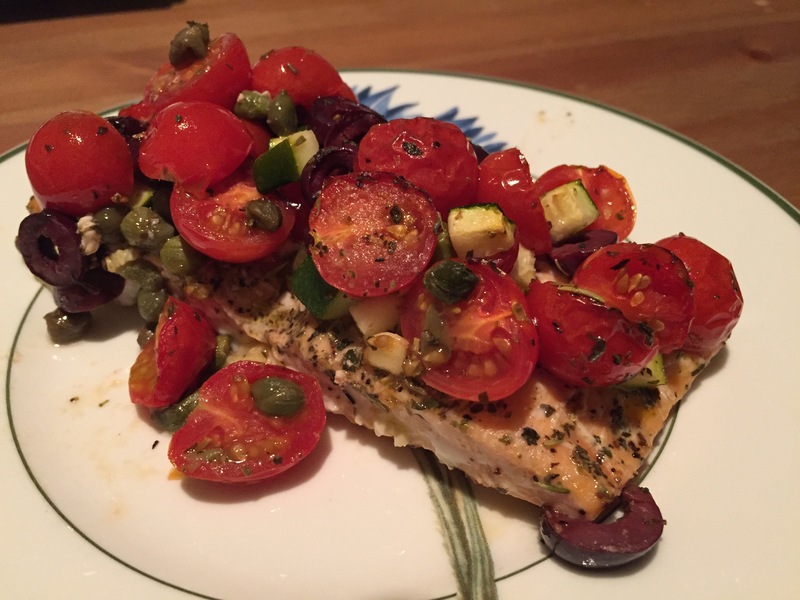 In a bowl, combine tomatoes, zucchini, capers, olives, olive oil and 1 tsp of the herbs. Stir well. 5. Spoon the vegetable mixture over the fish and then bake for 22 minutes or until fish flakes easily with a fork. Here’s another great recipe, this time for lunch – or anytime really. This is a great, easy to make, salad that tastes great. 1. In a shallow bowl, combine tomatoes, cucumber and onion, toss to mix. 2. In a small bowl, combine the olive oil, lemon juice, oregano, salt and pepper (to taste), stir well. 3a. 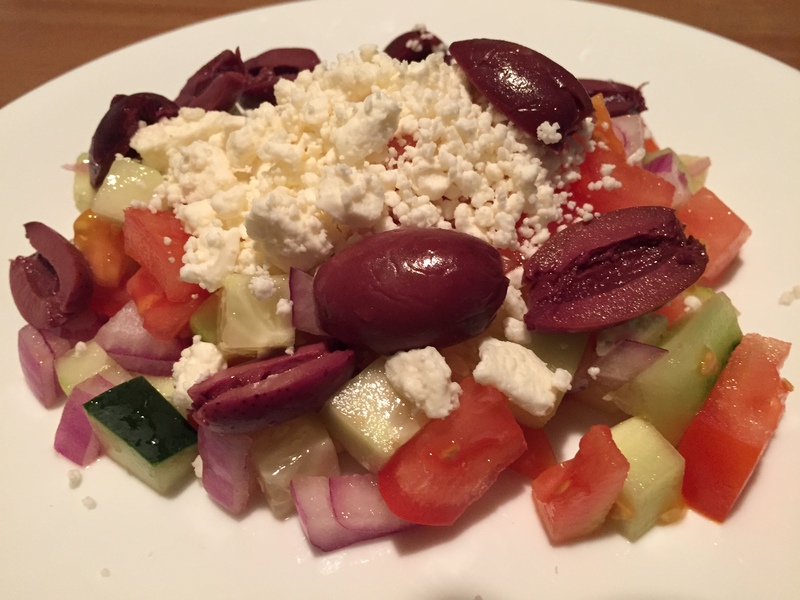 If you’re just preparing a single serving for yourself, place a serving of the tomato, cucumber and onion mix into a bowl or on a plate, sprinkle with the olive oil, lemon and oregano dressing, top with a handful of Feta and the olives. 3b. If you’re serving this to a group of people, sprinkle the entire salad with the dressing and top with Feta cheese and olives. Well, it’s been a while since I posted anything here. So here’s a new one for you and it’s friggin amazing! 2. Cook Penne pasta according to directions on the package (al dente). 3. Bring a saucepan of water to a boil. Plunge tomatoes into the boiling water and immediately remove to a medium bowl of ice water; drain. Remove and discard skins from tomatoes. Chop tomatoes and set aside. 4. Heat olive oil in a skillet over medium heat; saute onion until tender, about 5 minutes. Stir in tomatoes, garlic and Italian seasoning; cook until tomatoes are tender, 5 to 7 minutes. 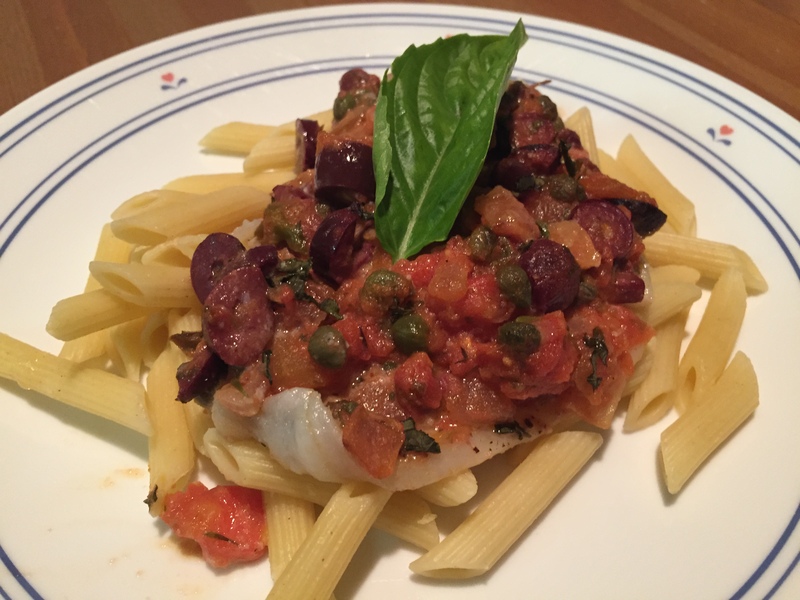 Mix in olives, wine, capers, lemon juice, and 1/2 the basil. Reduce heat, blend in Parmesan cheese, and cook until the mixture is reduced to a thick sauce, about 15 minutes. 5. Place flounder in a shallow baking dish. Pour sauce over the fillets and top with remaining basil leaves. 5. Bake 12-15 minutes in the preheated oven, until fish is easily flaked with a fork. Remove from oven and allow fillets to sit for 5 minutes to cool. What would happen if you smothered a filet of say, cod, in salsa and cheddar cheese and baked it? That was the question I sought to answer with this next recipe. It was incredible! 3. Rinse the fish under cold water and dry with paper toweling. 6. Bake, uncovered, for 20-25 minutes or until fish is opaque and flakes easily. Serve with avocado slices, sour cream and cilantro on top. A good side for this dish would be spanish rice. I have been on a big seafood salad kick, you know the stuff you buy at the grocery store made from imitation crab? Well I decided, “HEY! Why don’t I come up with my own recipe and save some cash in the process?” So I tried several different experiments and this was the one that worked out the best! I also decided not to name it Seafood Salad, because that name just isn’t accurate. Imitation crab is a Japanese form of Kamaboko, in which Surimi (a Japanese method which uses pulverized white fish) is combined with other ingredients to create something that resembles snow crab meat in appearance and in taste. 1. Combine the shredded imitation crab and all other ingredients in a large bowl. Mix thoroughly. 2. Cover with foil and refrigerate for at least 1 hour before serving. Tastes better if left to chill for more than an hour. Place a tablespoon of the salad on an 8″ warmed flour tortilla, add shredded lettuce and tomato slices and roll into a wrap. To make it into a real SEAFOOD salad, add cooked Shrimp, chopped into bite size pieces. May require a little more mayo. Add a tablespoon (or to taste) of Old Bay Seasoning to make the salad more Maryland style. If you want to spend the money, replace the imitation crab with real Snow Crab meat – just remember you need 1 lb of MEAT, not 1 lb of the crab legs…so yeah that’s a lot of snow crab legs. Sorry I haven’t posted any new recipes lately – dealt with a bad case of bronchitis and some other issues. 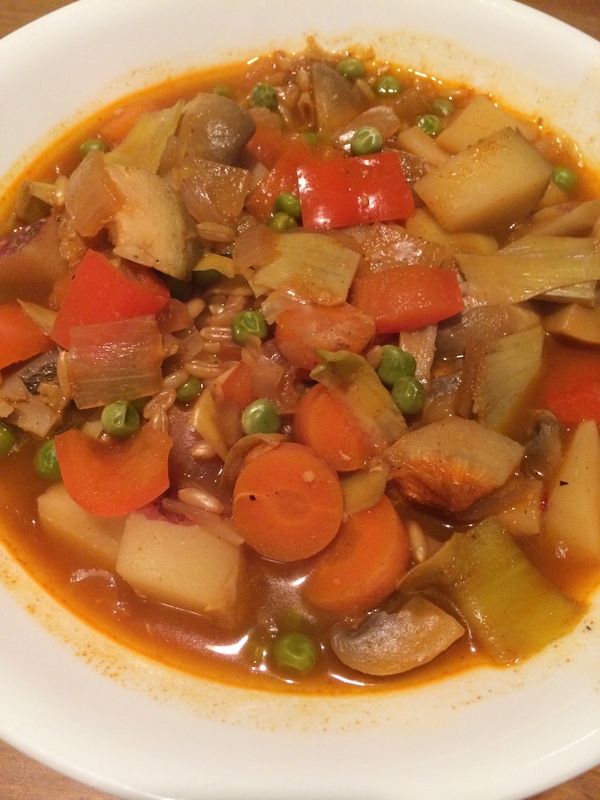 Now it’s time to get back to it…so here’s an awesome recipe that I tried just today. It was delicious! Cooked whole grain of your choice. 1. Combine the onion, garlic and bouillon in a large pot. 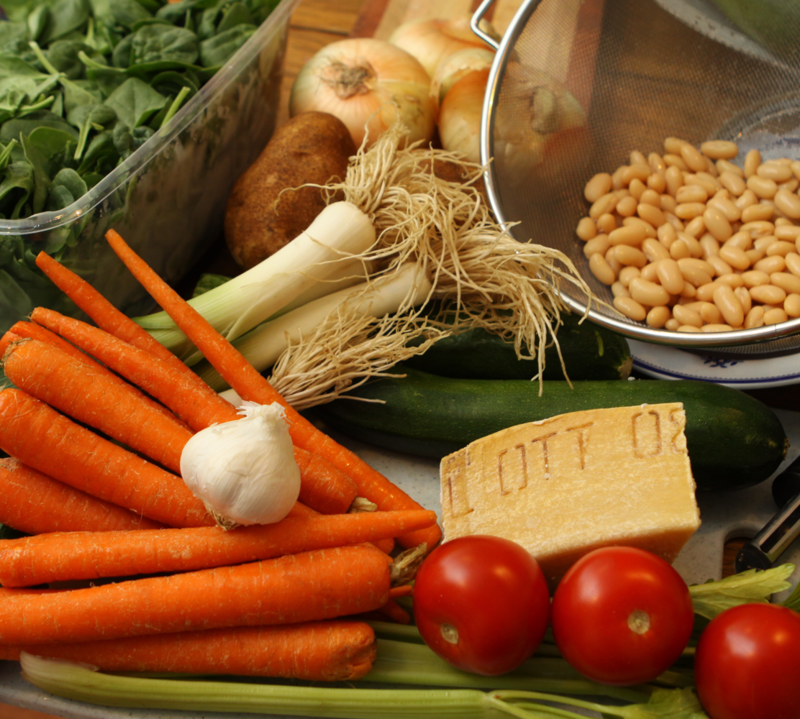 Bring to a boil, reduce the heat and simmer 5 minutes while preparing the other vegetables. 2. Add the carrots, potatoes , spices and sherry. Return the liquid to boiling, then reduce the heat and simmer until the vegetables are just tender. 3. Add the bell pepper, mushrooms and artichokes and simmer 5-10 minutes. 4. Stir in the peas, cook an additional 10 minutes to get those flavors going. Serve over the whole grains of your choice. Because I am a Pescetarian, I will sometimes add shrimp or crab meat (or both) to this recipe. It’s awesome regardless of whether or not you add anything extra. 1. Stir together oil and flour in Dutch oven or heavy-bottomed pot until smooth. Cook over high heat 10 minutes, or until roux turns a dark caramel color, stirring constantly. 2. Add onion, bell pepper, and celery, and cook 5 minutes, or until vegetables are softened. Stir in all remaining ingredients and 4 cups water. Season with salt and pepper. Reduce heat to medium-low, cover, and cook 40 minutes, or until carrots are tender.